There's a lot of concern about health care on both sides of the pond these days, with the recent worries about the National Health Service, and regime change in America bent on rolling back the benefits his predecessor put in place. In fact, one editorial to my regional newspaper had a headline that feared a return to the Dark Ages. 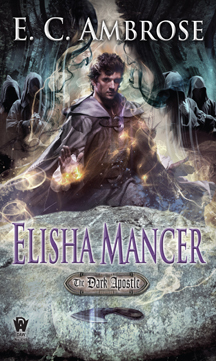 I write the Dark Apostle series for DAW books, dark historical fantasy about medieval surgery, which continues today with new release, Elisha Mancer. As a researcher into the history of medicine, all I could think was, they don't know much about the Dark Ages, do they? So here, for those who would like to make their comparisons more apt, is a basic primer to medical care through the 14th century. 1. Medical practitioners were highly educated professionals. Aside from those who needed the midwife (a specialist even then), most patients sought one of three levels of care, depending, then as now, on their location and their level of income (about which, more later). Continue reading A Surfeit of Emeralds: Healthcare in the Middle Ages. Charlie is traveling for a couple of days so I'm dropping by for a quick post. Remember me from last April? Dracula-movie guy? Vaguely familiar? Anyway, I wanted to kick around a few ideas about ebooks; authors (and some real people) have been talking this subject to death for years--decades, even--so what's new to say? Well, my book is new. My latest novel came out yesterday and I've been surprised by the way sales are running on Amazon.com. It's a huge difference from last year when the early ebook and pbook sales were pretty much neck and neck. This year it's not even close. Early orders for the Kindle edition of Circle of Enemies have been much, much higher than the physical book. The ebook cracked Amazon.com's Contemporary Fantasy bestseller list while sales rank for the mass market paperback barely moved out of five figures. A number of readers also told me that they ordered digital versions of the book after being unable to find it in a brick-and-mortar store on release day. I realize this isn't anything like a complete picture of sales trends, but it is interesting in the same way Netflix is moving away from mailing DVDs. Amazon.com is so well positioned to sell digital files that one glance at their list of Contemporary Fantasy bestsellers shows one unsurprising fact: It's not dominated by books put out by New York publishers. As I write this, the top three books are in the "Vampire for Hire" series, which are self-published, as are seven of the top ten. Amazon.com's digital customers appear to be moving toward self-published books and away from professionally-published ones. What does that mean for the future? Well, we're no strangers to love. You know the rules and so do I. A full commitment's what I'm thinking of. You wouldn't get this from any other guy. I just wanna tell you how I'm feeling. Gotta make you understand. Never gonna give you up. Never gonna let you down. Never gonna run around and desert you. Never gonna make you cry. Never gonna say goodbye. Never gonna tell a lie and hurt you. Okay, yeah, that was a rickroll. Hopefully, you laughed, which is more than you would have gotten out of my predictions of the future. The truth is, I don't know if anyone is really capable of calling the score on this one. Yeah the "book stink" people (the folks who are always talking about the way books smell) are the minority most of us expected, and ebook sales are growing, but the picture is more complex than that. Ebooks seem to be hitting mass market originals (like my books) much harder than hardbacks and trade-sized paperbacks, but how much more of a bite can they take? What happened to windowing? If ebook readers buy even more self-published books, will Amazon.com be less of a problem for brick-and-mortar indie stores? And what about those readers who really make a book into a mega-hit, the casual, two-book-a-year, everyone-else-has-read-DaVinci-Code-so-I-should-too people? It's fascinating (if slightly painful) and I'm curious to see if the market finds an equilibrium soon. I just wanna tell you how I'm feeling. ObPlug: Here's a couple of links for those curious about my books: New book, which Charlie has very kindly blurbed | Sample chapter | Entire series. My first author copy of the British edition of GLASSHOUSE came in the post today. The other author copies are coming from the warehouse shortly, which means it's going to be showing up in bookstores over the next few weeks. So if you're a UK native and wonder what I wrote after ACCELERANDO, now's your chance to find out (and here's the Amazon page to go to if you want to buy a copy). Or rather, I'm one of the folks Rick Kleffel interviewed for Weekend Edition Sunday, which you can catch online via the link. 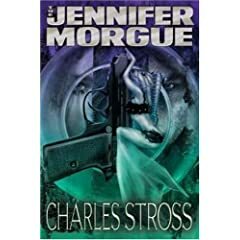 A little bird tells me that my latest novel, The Jennifer Morgue, should be on its way to bookshops this week. It's a sequel to "The Atrocity Archives", and continues the adventures of Bob Howard, network administrator and computational demonologist. You can find copies either in your local specialist bookstore, or via Golden Gryphon (the publisher) at the link above, or (if you insist) at Amazon.com (US) or Amazon.co.uk (UK). Note that this is the amazing, high quality first edition printed on real paper; if you want a year you'll be able to get it in paperback from Ace and Orbit, but that won't be the same. Please consider buying a copy. My widow and all sixteen orphans, not to mention the livestock, will be eternally grateful. It's one nightmarish panopticon that Stross has built here, and I can think of no greater testament to its effectiveness than my own relief at having been liberated from it. Singularity Sky - now in Japanese! I don't normally blog translations here, but I thought this was particularly noteworthy. 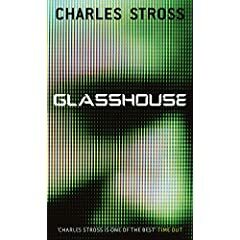 SFReviews have a review of Glasshouse. I'm very pleased to announce the Accelerando has won the Locus Award for best science fiction novel of 2005. Details here. This page is an archive of recent entries in the Publicity stuff category.